It's been a while since I've posted on here, I've taken a short blogging break and not felt inspired to write. I've been busy planning new blog ideas and things to write about in general. I've taken a few months off to just focus on me. Over the last few months, I've moved and settled into a new place where living on your own is a whole new experience in itself! 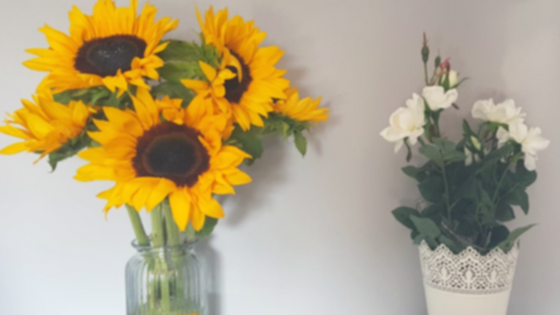 Whilst I've not been blogging, I've had an experience I've been dealing with or shall I say, currently still dealing with. After an hour or so, it hadn't stopped and so I went to the first aid part of Thorpe Park to get it seen too. I was given an ice pack and told to get an appointment for the doctors that evening. This was a Sunday, doctors in my end of the country aren't open and if they are, you can never get an appointment. After the day at Thorpe Park, my arm wasn't any better and so Tiernan (my fiancee) decided to call 111 for advice, after many questions they said someone would call me back. I was advised to go down to A&E. By the time we had gotten down to the A&E department, it was twenty to ten. I was told I was in for a long wait. There were many casualties, many football sprains, head injuries and there was me, sat in the waiting room, with a lump. My arm at this point was starting to swell and a rash had begun to appear around the lump, and the lump was still oozing pus! Thirty minuets later, I was called into see a nurse who examined my arm. He paused, looking me in the eye. "you can see the fang marks, probably a false widow spider"
Great. That now sent my anxiety into overload. I'd seen pictures of bites all over the internet and heard stories about their bites, and was scared of what was going to happen. I was told I had to wait for the doctor and that was a three hour wait to be seen. After googling false widow bites (which was the worst idea in the world) I had freaked myself out a little bit and wanted to get this bite looked at. At 1 am, I finally got seen, the doctor looked and said he thought it was a bite but wasn't sure. I was given antibiotics and told that it should clear up in a few days. With my antibiotics, I felt like I'd be better in no time. 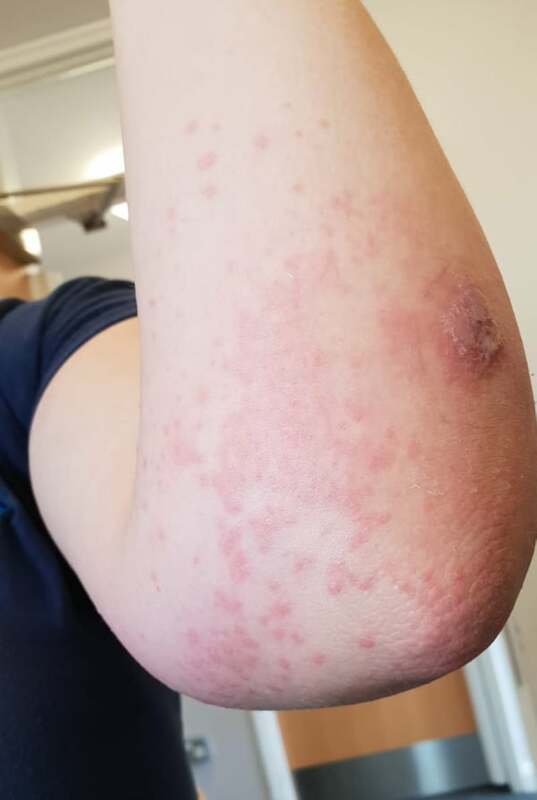 After a few days the rash continued spreading and my arm began to swell. One side of my face had swollen up and the same with my foot. I called the doctor who referred me to out of hours doctor, who then gave me cream to stop the rash. With not really an explanation, I applied the cream to my bite and rash. This only made it spread further and my whole arm, both hands and feet (on top and underneath) had swollen. I was spotty and sore. My feet had turned purple and red. It was hard to walk on my feet and found shoes hard to wear. I walked around in socks as much as I could. My whole body itched, it was sore and unbearable. I felt like my body was burning and the only was I could ease some of the pain was to either itch it, find somewhere cool to sit or have a cold bath or shower. At night, I had a fan blowing on my feet to try and cool them and I'd get up in the middle of the night to run parts of my body under the shower as it hurt to much to sleep. The cream wasn't working and was making everything worse. Where I was applying it, the rash just continued to spread. I tried again to get another appointment but managed to get an out of hours appointment... to which I was told I had a skin condition and they weren't sure if I was bitten at all. I was told it was my fault for scratching and I had made it spread because of this. There was nothing they could do because he wasn't my doctor. "wow, what are you allergic too." After examining me and looking closely at my lump. I finally learnt what was wrong with me. I had been bitten by either a false widow spider or a spider that deadly such as a huntsman. The venom from the bite had caused by body to have a severe allergic reaction. The antibiotics I was on wasn't strong enough and had helped to prolong the reaction. I was told I was lucky because it could have gotten a lot worse if I hadn't of gone back and got it checked. If I had left it a few days, I could have gotten a lot worse with most of my body swelling up. He said he had seen a lot of bites this summer due to the weather in the UK being so nice, but my bite was by far the worst he had been this year. I was asked if I had felt the bite...I hadn't at all. I was told to get medication immediately and take them as soon as I had gotten them. I was put on antihistamine, strong steroids and antibiotics. A few days later, the rash began to go down and my body wasn't as sore. The swelling in my body went down and my feet began to look less purple. I've been on that medication for nearly week and I feel so much better. My lump on my arm has gone down and I now can see the fang marks where the bugger bit me. It's still sore but at least I'm not swollen anymore. I'm still a bit spotty but they'll go down in time. Two weeks on, I'm a bit wary of spiders now. I'm not scared of them, I just don't like the little buggers. I saw a spider in the flat and instead of picking it up with my hand, I used a cup and a book and shoved it out the window. I shan't be going near a spider any time soon! Have you ever been bitten by anything? Or come across a spider?